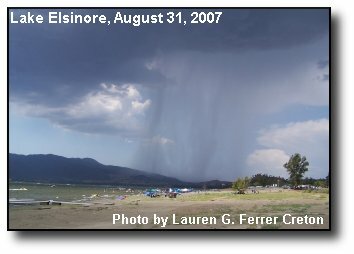 Monsoon Cloud: A towering cloud over the lake. Photo courtesy of John Pitt. 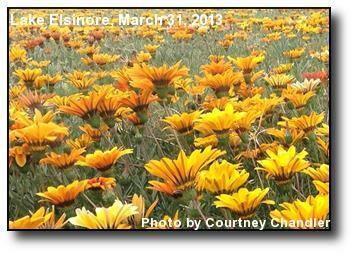 Field of Flowers: Flowers in bloom on Easter Sunday in Lake Elsinore. Photo courtesy of Courtney Chandler. 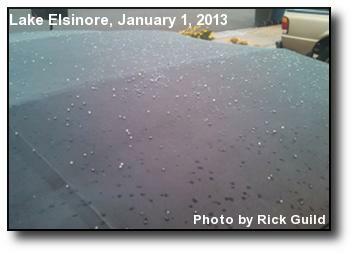 New Year's Hail: A light round of hail landed on north Lake Elsinore on New Year's Day, not enough to tip the rain gauge. Photo courtesy of Rick Guild. 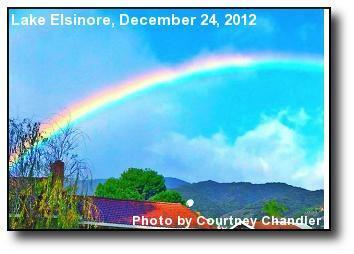 Christmas Eve Rainbow: Bringing out the best of a rainy day. Photo courtesy of Courtney Chandler. 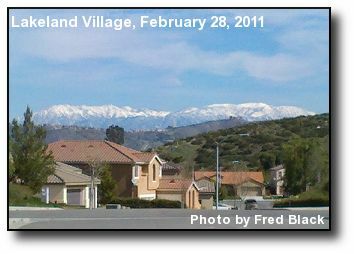 Ortega Snow: Snow adorns Ortega Mountain after a late-December storm. Photo courtesy of Rick Guild. 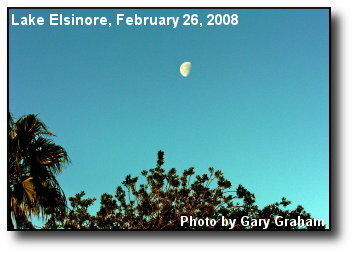 Morning Moon: The moon setting in the early morning in the southern Lake Elsinore skies. Photo courtesy of Ray Ward. 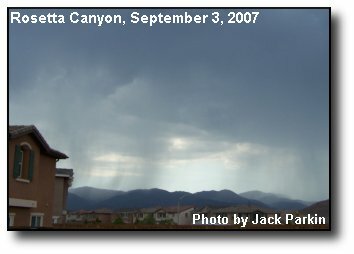 Rain Storm: Stormy weather from Tuscany Hills, looking west over Lake Elsinore and the Ortega Mountains. Photo courtesy of Dan Baldwin. 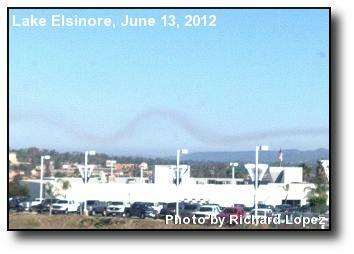 Wisp of Smoke: Smoke from a local fire catches some thermals above Lake Elsinore. Photo courtesy of Richard Lopez. 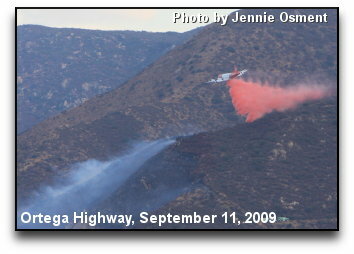 Fire Drop: A CDF tanker lets a fire near El Cariso have it during a bombing run. Photo courtesy of Jenny Osment. 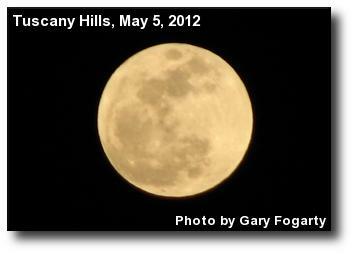 Cinco de Mayo Moon: A full super moon over Tuscany Hills. Photo courtesy of Gary Fogarty. 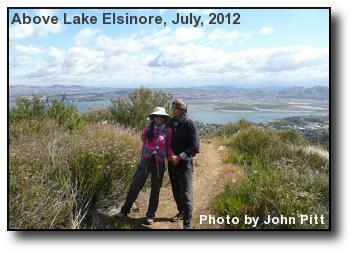 Summer Hike: A couple of hikers enjoy the morning view above Lake Elsinore. Photo courtesy of John Pitt. 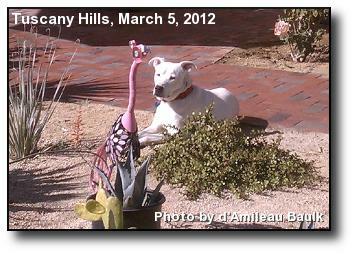 Lazy Stalking: Greta the dog stalks the rare Elsinore pink flamingo. Photo courtesy of d'Amileau Baulk. 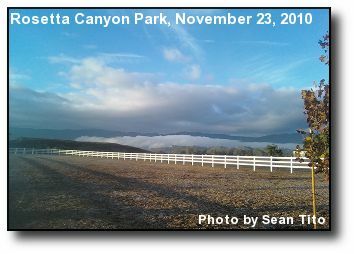 High and Low: This easterly morning view features clouds high and low, obscuring Canyon Lake. Photo courtesy of Gary Fogarty. 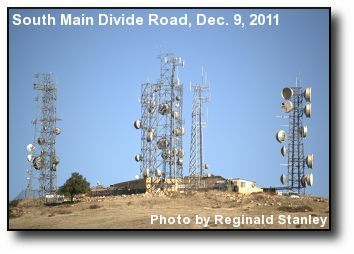 Radio Towers: An assortment of radio towers on Elsinore Peak, in the Santa Ana mountains above Wildomar. Photo courtesy of Reginald Stanley. 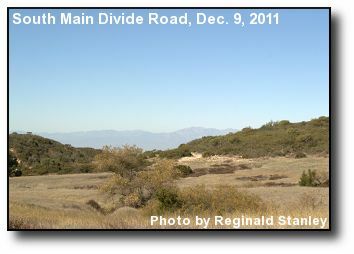 Mountain Meadow: A meadow in the Santa Ana Mountains, above Lake Elsinore and Wildomar. 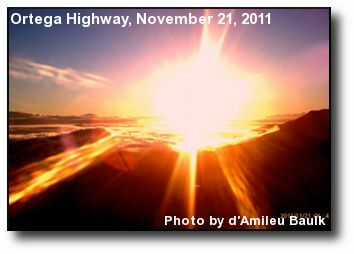 Photo courtesy of Reginald Stanley. 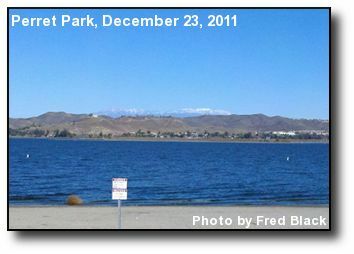 Distant Snow: Across Lake Elsinore, a snow-capped San Gorgonio mountain rises in the distance. Photo courtesy of Fred E. Black. 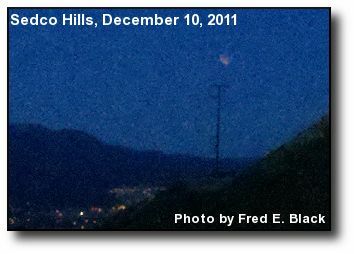 Lunar Eclipse: The December, 2011 lunar eclipse above Lake Elsinore. Photo courtesy of Fred E. Black. 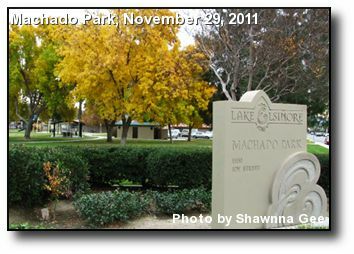 Golden Leaves: Brilliant colors at Machado Park. Photo courtesy of Shawnna Gee. 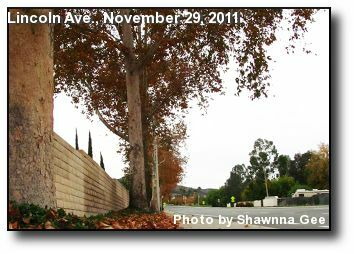 Fall Leaves: Red and brown mark the final stages of the season for this tree. Photo courtesy of Shawnna Gee. 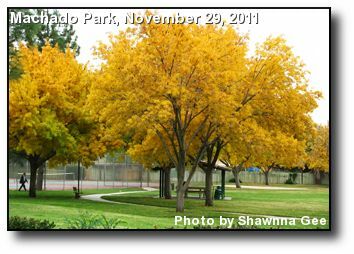 Fall Colors: Trees meet the season in Machado Park. Photo courtesy of Shawnna Gee. 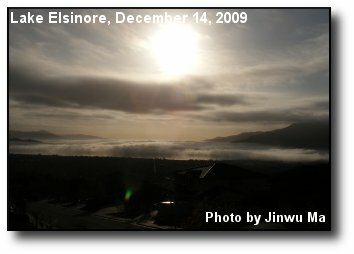 Sunrise over Clouds: The sun rises over Lake Elsinore, shrouded with clouds. Photo courtesy of d'Amileu Baulk. 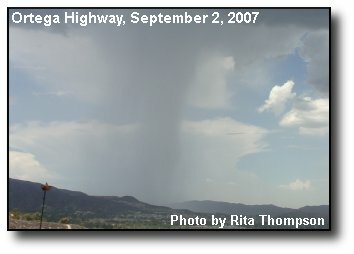 Streaming Clouds: Moist summer clouds stream through the morning sky, north of the Ortega Highway. Photo courtesy of Jeff Black. 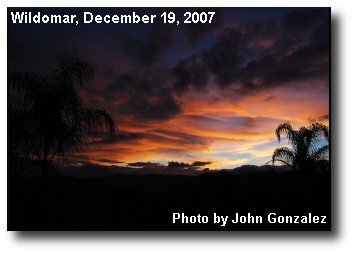 Monsoon Sunrise: Clouds glisten at sunrise during a surge of subtropical moisture. Photo courtesy of d'Amileu Baulk. 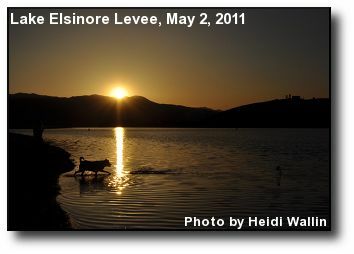 Sunset Stroll: A dog strolls into the lake at sunset, near the Lake Elsinore levee. Photo courtesy of Heidi Wallin. 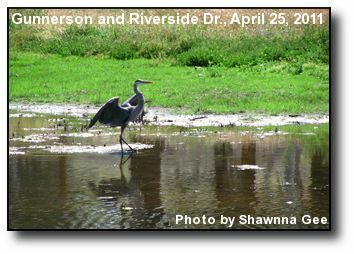 Blue Heron: This elegant bird stuts and flaps through a Lake Elsinore marsh. Photo courtesy of Shawnna Gee. 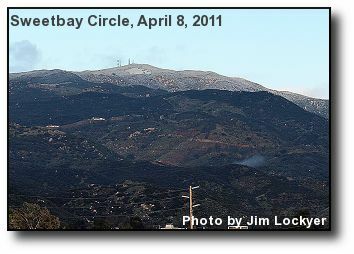 Snow Dusting: Elsinore Peak, above Wildomar, with a light covering of the white stuff. Photo courtesy of Jim Lockyer. 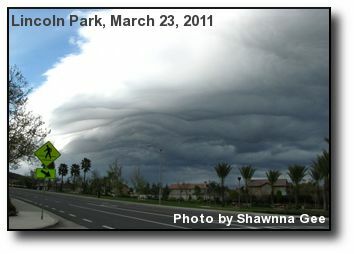 Cloud Stream: A formation of ominous clouds flows by in the Elsinore sky. Photo courtesy of Shawnna Gee. 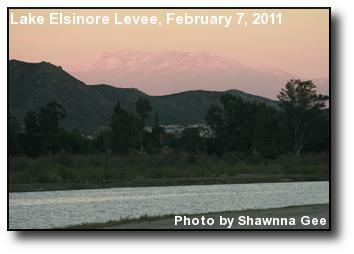 Mountain Tops: The San Bernardino mountains glisten white above Lake Elsinore's hills. Photo courtesy of Fred Black. 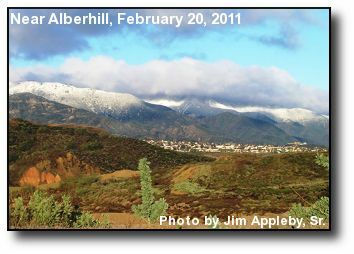 Mountain Snow: A view of Horsethief Canyon Ranch after a February storm, with snowfall blanketing the Santa Ana mountains. 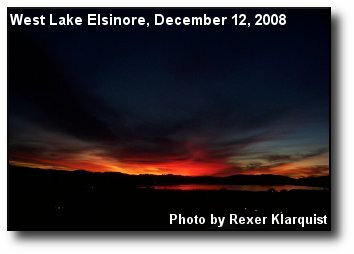 Photo courtesy of Jim Appleby, Sr..
Eastern Lights: The evening lights of southern Lake Elsinore, from the Lake Elsinore levee. Photo courtesy of Shawnna Gee. 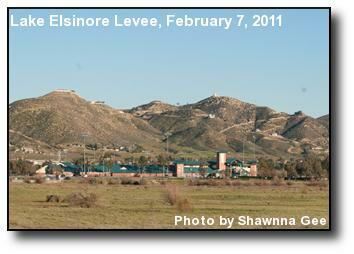 The Diamond: The Lake Elsinore Diamond ballpark, set off by itself from the levee path at the south end of the lake. Photo courtesy of Shawnna Gee. 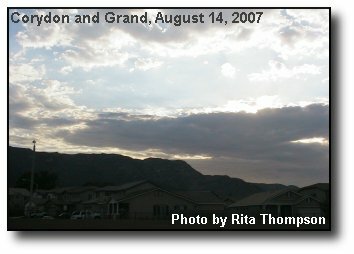 Ghostly Mountain: Mt. 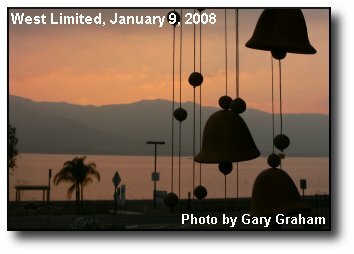 San Jacinto's distinctive peak rises above the eastern Lake Elsinore hills at sunset. Photo courtesy of Shawnna Gee. 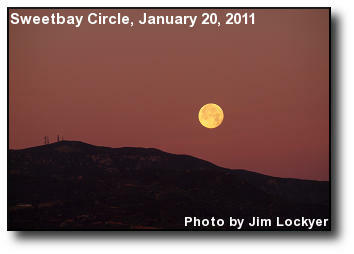 Moonset: A full moon setting over the Santa Ana Mountains at sunrise near Elsinore Peak. Photo courtesy of Jim Lockyer. 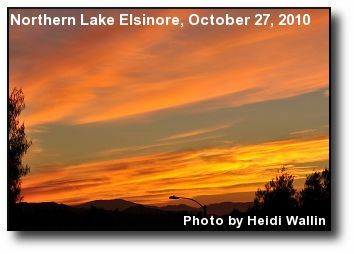 Colorful Sunset: High clouds and dust particles from a windy day are ingredients for a colorful sunset over Lake Elsinore. Photo courtesy of Shawnna Gee. 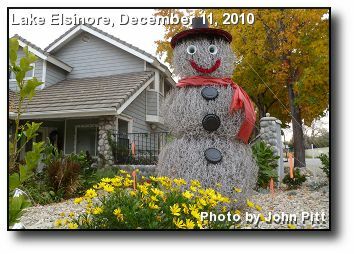 Tumbleweed Snowman: A home-made snow man assembled from local tumbleweeds. Photo courtesy of John Pitt. 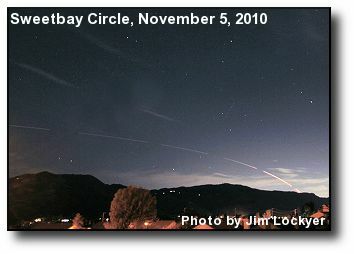 Rocket Launch: A multi-exposure capture of a Delta II rocket launch from Vandenberg Air Force Base. Photo courtesy of Jim Lockyer. 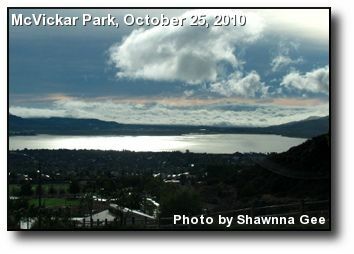 Clouds and Fog: A westerly view of a two cloud layers, fog over the lake and more spilling over the mountains. Photo courtesy of Sean Tito. 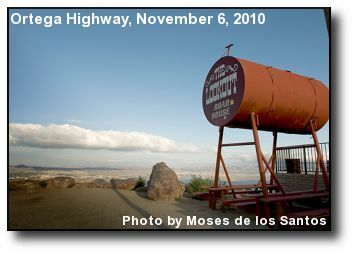 Lookout: A view of Lake Elsinore as seen from The Lookout atop the Ortega Highway. Photo courtesy of Moses de los Santos. 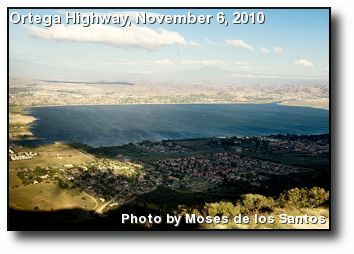 Autumn Afternoon: Lake Elsinore is a deep blue, as seen from the top of the Ortega Highway on a November afternoon. Photo courtesy of Moses de los Santos. 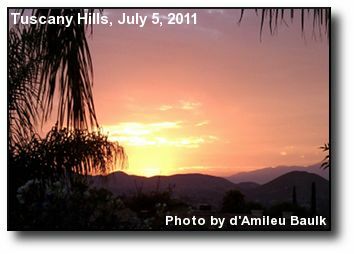 Sunrise Color: Orange hues enlighten the clouds at sunrise. Photo courtesy of Heidi Wallin. 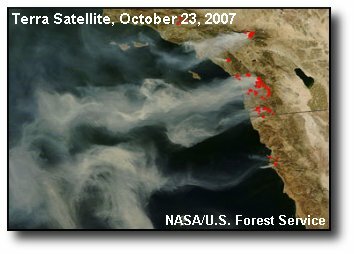 Distant Fog: Beyond the lake, marine layer fills the southern inland valley. Photo courtesy of Shawnna Gee. 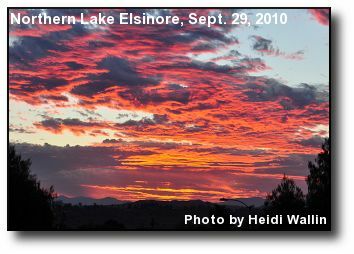 Brilliant Sunrise: The morning sky over Lake Elsinore, filled with clouds. Photo courtesy of Heidi Wallin. 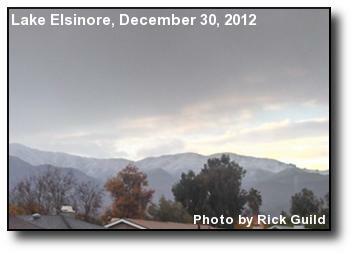 Cloudy Morning: Clouds abound as the morning gets underway in Lake Elsinore. Photo courtesy of Shawnna Gee. 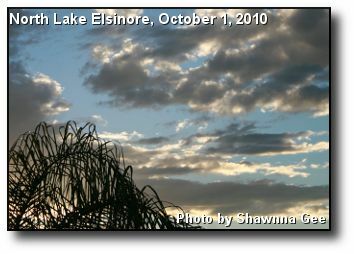 Autumn Sunrise: Scattered clouds after sunrise in the Lake Elsinore sky. Photo courtesy of Shawnna Gee. 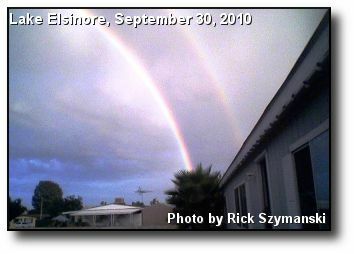 Rainbow's End: A double rainbow ends near the Lake Elsinore weather station (anemometer visible at the lower left). Photo courtesy of Rick Guild. 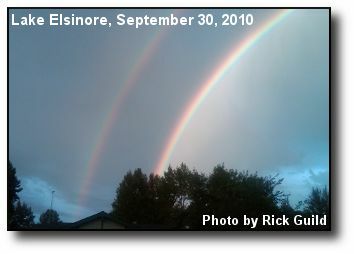 Double Rainbow: A humongous double rainbow rises between the sun and the rain. Photo courtesy of Rick Szymanski. 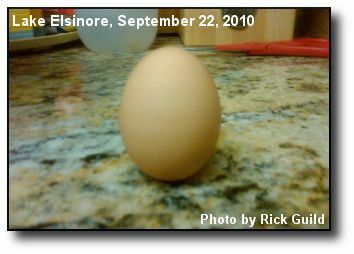 Egg Balancing: An old myth suggests you can balance an egg on end during equinoxes. Photo courtesy of Rick Guild. 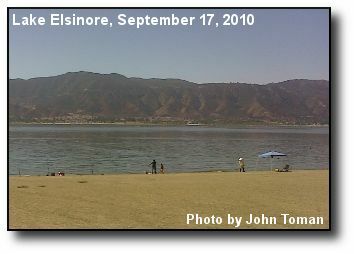 Lake Fishing: An afternoon of fishing on the eastern shore of Lake Elsinore. Photo courtesy of John Toman. 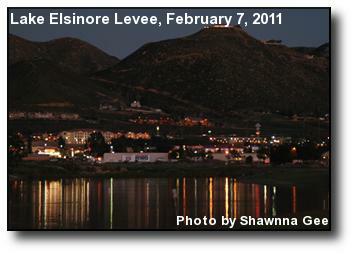 Evening Lights: The lights of the city surround a serene Lake Elsinore. Photo courtesy of Jinwu Ma. Fog Shroud: After a night of rain, a layer of fog sits on the lake. Photo courtesy of Jinwu Ma. 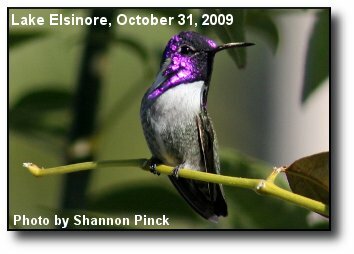 Purple Guy: A Costa's Hummingbird shows off its purple cap and throat on Halloween. Photo courtesy of Shannon Pinck. 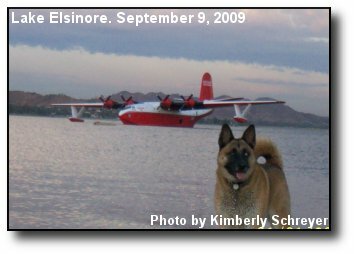 On Tap: A dog (Balthazar) seems to guard the Martin Mars tanker at the north shore of Lake Elsinore. Photo courtesy of Kimberly Schreyer. 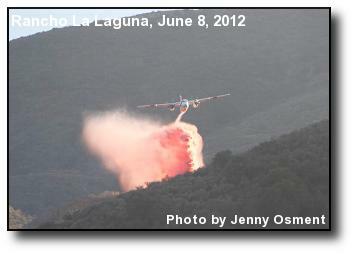 Plane Drop: A fire bomber drops retardant on a wildfire off of the Ortega Highway. Photo courtesy of Jennie Osment. 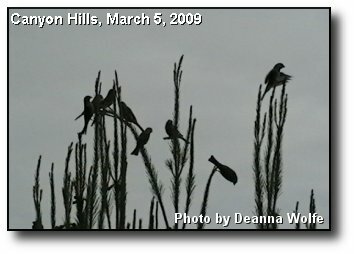 Hanging Around: One of these birds is not like the others on this tree in Canyon Hills. Photo courtesy of Deanna Wolfe. 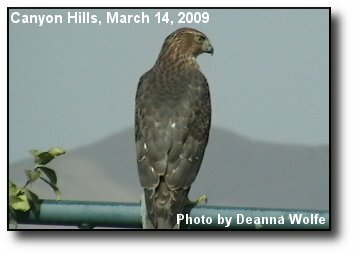 Vigilance: A local hawk keeps a watchful eye out for prey. Photo courtesy of Deanna Wolfe. 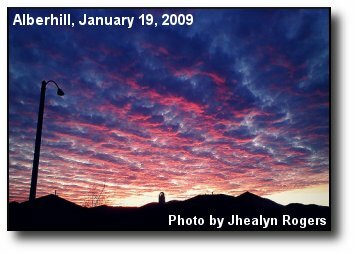 Morning March: A sunrise snapshot of a cloud formation marching above the city. Photo courtesy of Jhealyn Rogers. 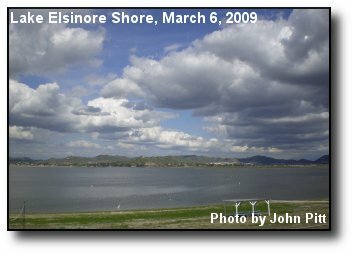 Clouds over Elsinore: From the shores of Lake Elsinore, a view of clouds streaking over the lake. Photo courtesy of John Pitt. 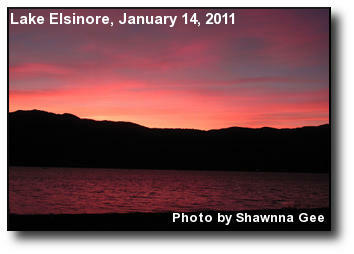 Lake at Sunrise: Early morning light over Lake Elsinore. Photo courtesy of Rexer Klarquist. 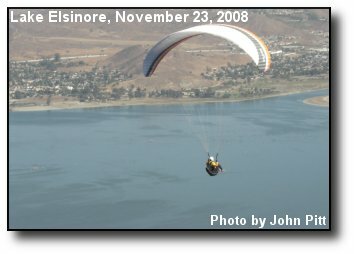 November Thermal: Riding a late November thermal above Lake Elsinore. Photo courtesy of John Pitt. 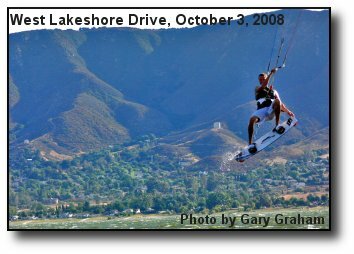 High Flier: A kite boarder exploits recent windy conditions on Lake Elsinore. Photo courtesy of Gary Graham. 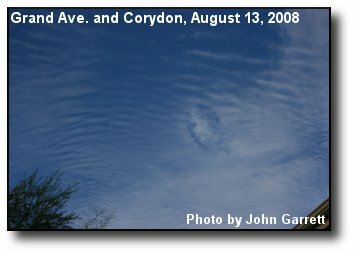 Heavenly Thumbprint: Stratos clouds appear to form a thumbprint in the sky. Photo courtesy of John Garrett. 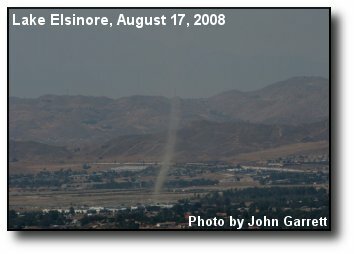 Dust Devil: A dust devil kicks around in back basin of Lake Elsinore, viewed from the Santa Rosa Plateau Ecological Reserve. Photo courtesy of John Garrett. 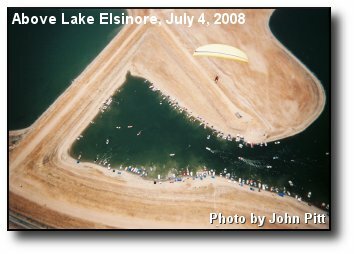 From Above: A paragliding perspective of over 100 boats playing in the Lake Elsinore cove. Photo courtesy of John Pitt. 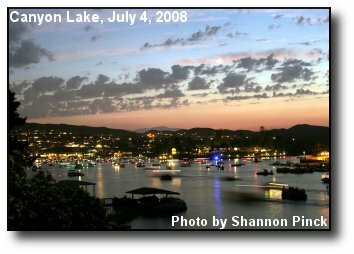 Summer Sunset: A flotilla of boats and lights on Canyon Lake before Independence Day fireworks. Photo courtesy of Shannon Pinck. 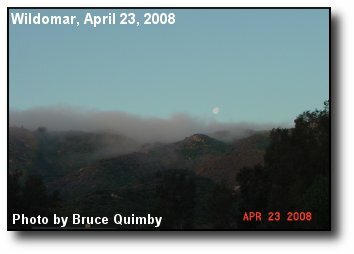 Marine Layer: Low clouds spill over the Ortega foothills above Wildomar, with the morning moon about to set. Photo courtesy of Bruce Quimby. 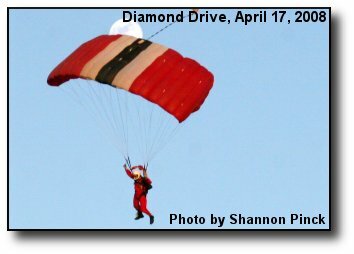 Stadium Dive: The Red Devils Parachute Regiment skydive into the Lake Elsinore Diamond. Photo courtesy of Shannon Pinck. 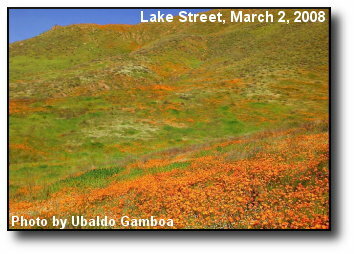 Elsinore Poppies: For the first time since 2005, California Golden Poppies cover Lake Elsinore's northern hills. Photo courtesy of Ubaldo Gamboa. 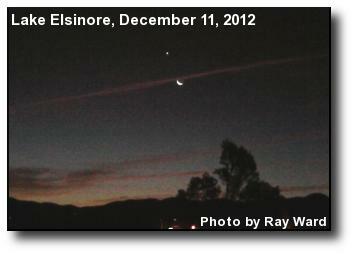 Morning Moon: The crescent moon above Lake Elsinore on a recent clear morning. Photo courtesy of Gary Graham. 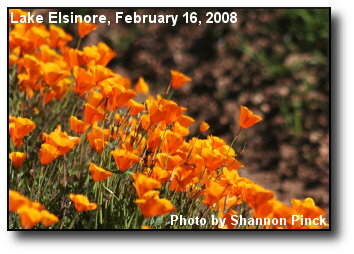 Golden Poppies: The California state flower blooming prolifically in Lake Elsinore. Photo courtesy of Shannon Pinck. 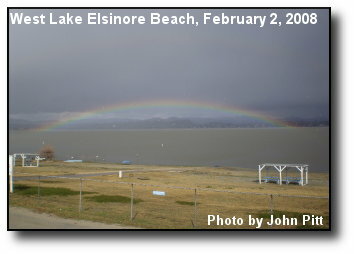 Full Rainbow: From Lake Elsinore's west shoreline, both ends of a rainbow appear to touch the water. Photo courtesy of John Pitt. 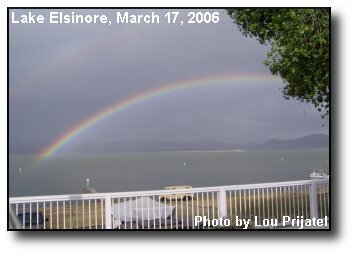 Between Storms: A rainbow above the lake between storms in Elsinore. Photo courtesy of Gary Graham. 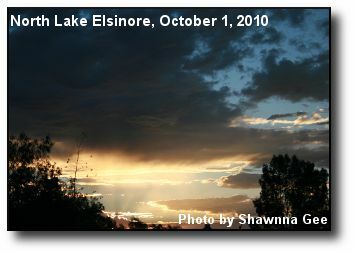 Lake at Sunset: Near the eastern shore of Lake Elsinore, the sun settles and the lake gleams. 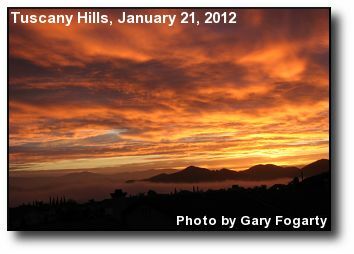 Photo courtesy of Gary Graham. 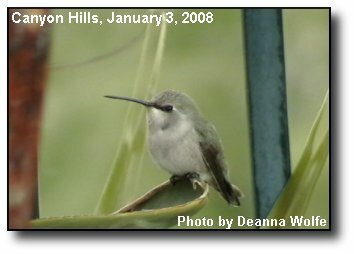 Resting Feather: A resident hummingbird rests on a leaf in a Canyon Hills backyard. Photo courtesy of Deanna Wolfe. 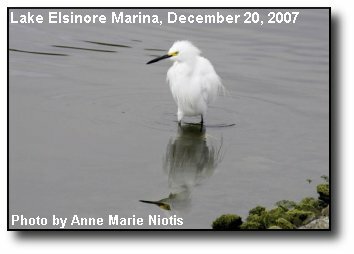 Mirror Image: A juvenile snowy egret sees a reflection of itself near the Lake Elsinore marina. Photo courtesy of Anne Marie Niotis. 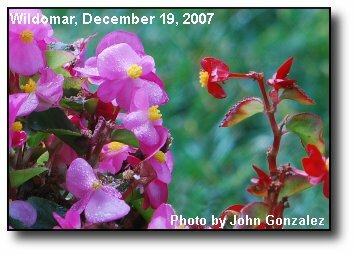 Backyard Begonia: Raindrops cover begonias after showers fell on a Wildomar backyard. Photo courtesy of John Gonzalez. 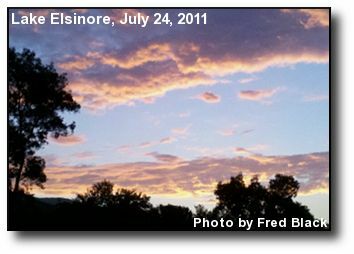 After-storm Sunset: Fading light illuminates a cloud formation after recent rains. Photo courtesy of John Gonzalez. 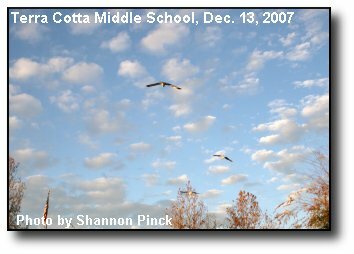 Flight Trio: Pelicans in flight in the Lake Elsinore sky. Photo courtesy of Shannon Pinck. 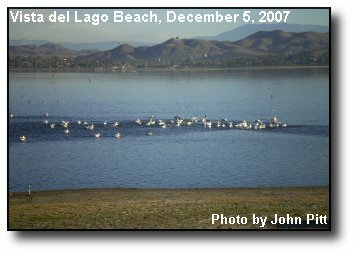 Pelican Feeding: A group of migrating pelicans enjoy a morning feeding at Lake Elsinore. Photo courtesy of John Pitt. 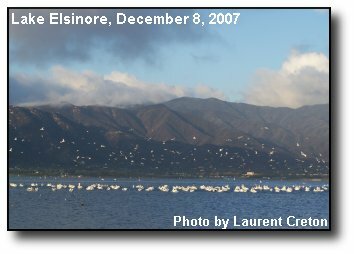 Pelican Migration: Thousands of migrating American white pelicans enjoy Lake Elsinore's hospitality Photo courtesy of Laurent Creton. 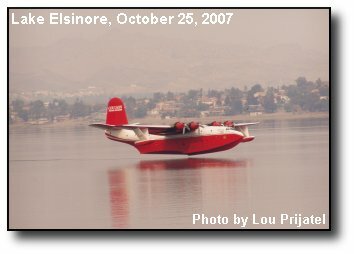 Martin Mars: The firebomber from Canada helped fight the local fires in October, based from Lake Elsinore. Photo courtesy of Lou Prijatel. 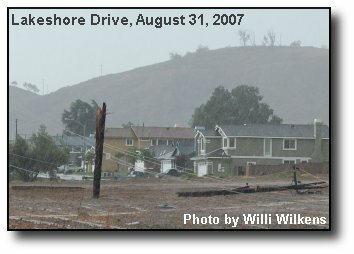 Micro Burst: The August 31st severe storm left uprooted trees, downed power lines, a damaged roof and a three-hour power outage. Photo courtesy of Laurent G. Ferrer Creton. 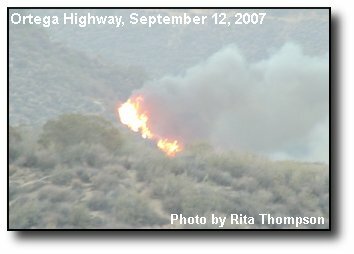 Laguna Fire: Flames from a wildfire creep up the mountainside near the Ortega Highway. Photo courtesy of Rita Thompson. 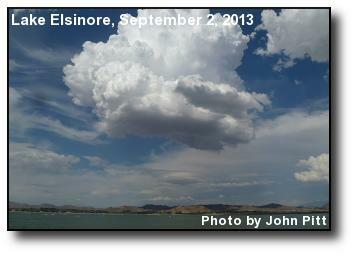 Labor Day Thunderstorm: Another day of thunderstorms, looking west over Lake Elsinore. Photo courtesy of Jack Parkin. 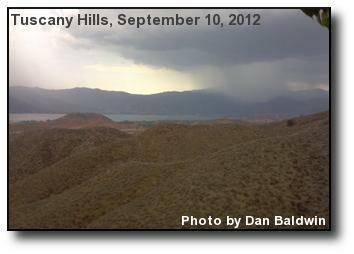 Northern Downpour: Rain falls near Horsethief Canyon Ranch just before a funnel cloud was spotted in Lake Elsinore. Photo courtesy of Rita Thompson. 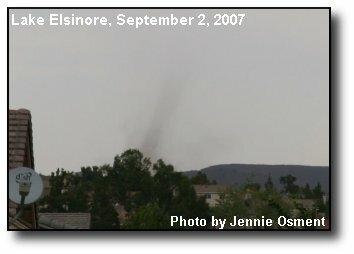 Sunday Tornado: A second tornado in two days over Lake Elsinore (there were no reports that this one touched the ground). Photo courtesy of Jennie Osment. Downed Power: A possible mini-tornado from a severe storm snapped these power lines on Lakeshore Drive. Photo courtesy of Willi Wilkens. 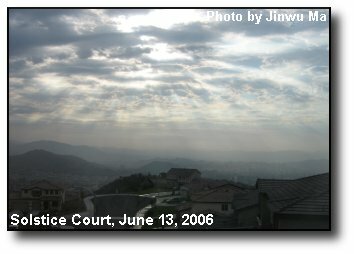 Ortega Sunset: Clouds stream from above the Ortega highway in western Lake Elsinore. Photo courtesy of Rita Thompson. 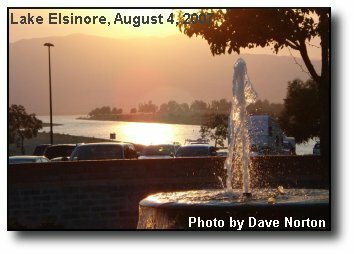 Diamond Fountain: A fountain at the Diamond in Lake Elsinore, with the San Jacinto River and the lake in the background. Photo courtesy of Dave Norton. 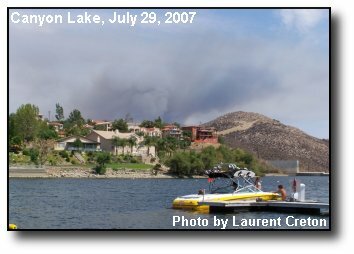 Smoke Plume: Smoke rises from a small fire along the San Jacinto river in Lake Elsinore, as seen from Canyon Lake. Photo courtesy of Laurent Creton. 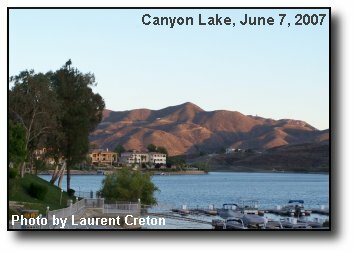 Canyon Lake: The Railroad Canyon Reservoir, as seen from the east. Photo courtesy of Laurent Creton. 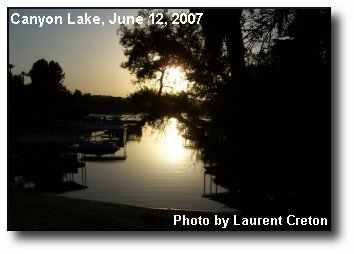 Boats at Sunset: Fading light on the water silhouettes boats moored on Canyon Lake. Photo courtesy of Lauren Creton. 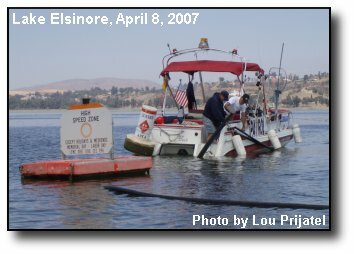 Aeration Project: Boats position 5000 foot pipes to bubble oxygen into Lake Elsinore. Photo courtesy of Lou Prijatel. 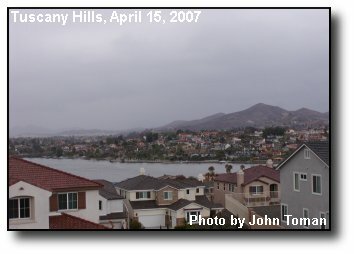 Lake Houses: Homes line Canyon Lake, as seen from the Tuscany Hills area. Photo courtesy of John Toman. 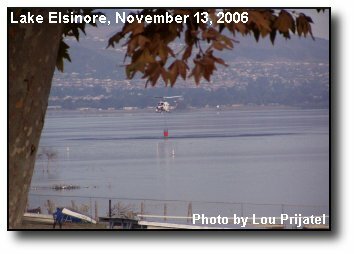 Lookout Fire: A helicopter scoops water out of Lake Elsinore to drop on the Lookout Fire, above the Elsinore Valley. Photo courtesy of Lou Prijatel. 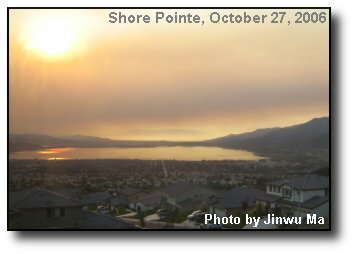 Esperanza Smoke: Smoke from the October Esperanza Fire obscures the sun over Lake Elsinore. Photo courtesy of Jinwu Ma. 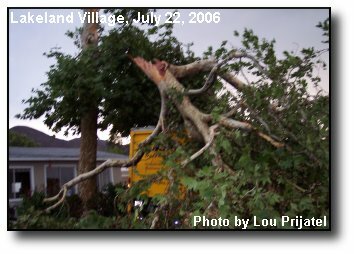 Storm Damage: A downed tree in Lakeland Village after thunderstorms punctuated a record-hot day. Photo courtesy of Lou Prijatel. 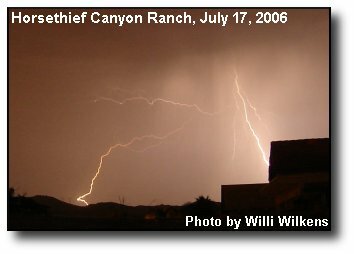 Thunderstorm Complex: Intense and beautiful displays of lightning capture from Horsethief Canyon Ranch. Photo courtesy of Willi Wilkens. 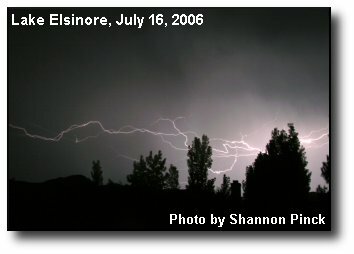 Rippling Energy: A lightning strike over the Elsinore Valley punctuates a night of thunderstorms. Photo courtesy of Shannon Pinck. 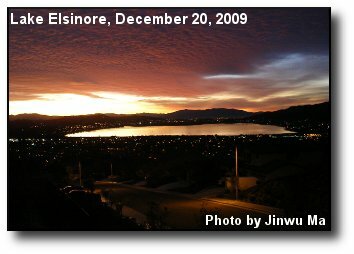 Radiant Morning: From atop the Shore Pointe community, morning sun spreads over Lake Elsinore. Photo courtesy of Jinwu Ma. 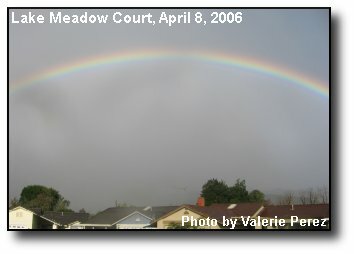 April Rainbow: Looking towards the Ortega mountains during the April storms. Photo courtesy of Valerie Perez. 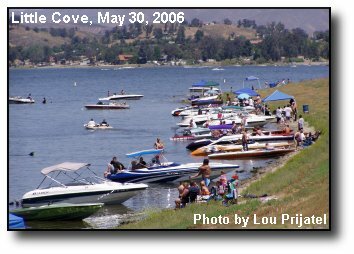 Memorial Day: A line of boats at Little Cove on Lake Elsinore. Photo courtesy of Lou Prijatel. 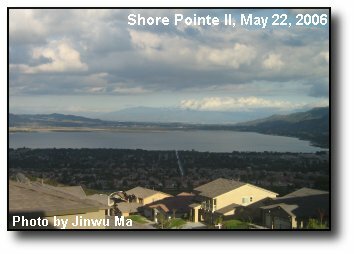 South View: Lake Elsinore and the southern hills below shadowy clouds. Photo courtesy of Jinwu Ma. 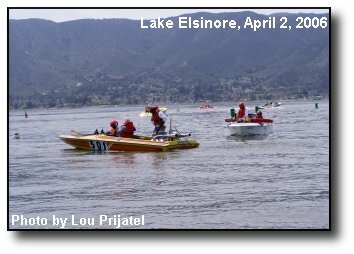 Sunday Race: Boats prepare for a water ski race on Lake Elsinore. Photo courtesy of Lou Prijatel. 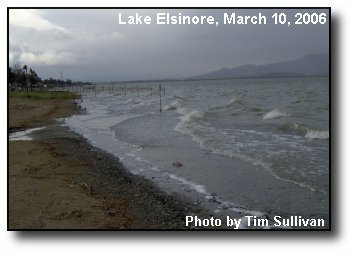 Stormy Lake: Waves break on the eastern shore of Lake Elsinore between cloud bursts. Photo courtesy of Tim Sullivan. 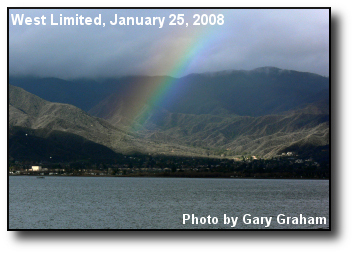 Lake Rainbow: A rainbow floats above the Lake after a recent storm. Photo courtesy of Lou Prijatel. 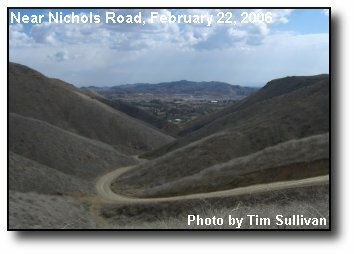 Eastern Hills: A peek along a winding dirt road east of Lake Elsinore. Photo courtesy of Tim Sullivan. 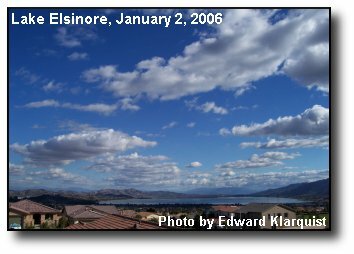 New Year's Clouds: Aftermath of a winter storm above Lake Elsinore. Photo courtesy of Edward Klarquist. 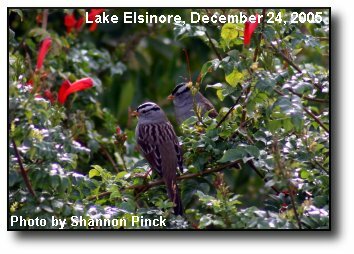 Backyard Birds: A pair of birds sunbathing on a beautiful morning. Photo courtesy of Shannon Pinck. 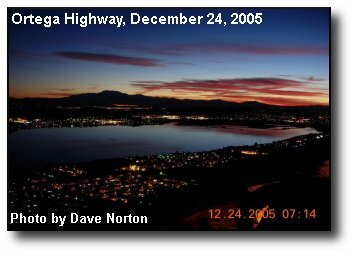 Ortega Sunrise: Predawn colors reflect off Lake Elsinore, seen from the Ortega grade. Photo courtesy of Dave Norton. 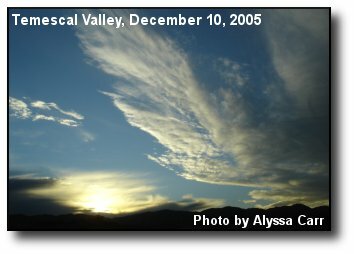 Sunset Clouds: Cloud "wings" punctuate a sunset near Tom's Farms in Temescal Valley. Photo courtesy of Alyssa Carr.